« Multi-colored Potato Salad for the Fourth! It is now day three of Operation Blackberry. Had lots of errands to run this morning with the nephews coming and all. When I got back from grocery shopping, I was still staring at four quarts of blackberries. What to do, what to do? As I was putting up groceries, I had to move some of my vinegars around to make room in the pantry. My eyes fell on a couple of different types of raspberry vinegars. Hmmm. Surely I could find a recipe for blackberry vinegar. I imagined how good a blackberry vinaigrette would be on a spinach salad. One quick Google search later and I think I found a keeper. I found a really good recipe for Blackberry Vinegar at CD Kitchen. 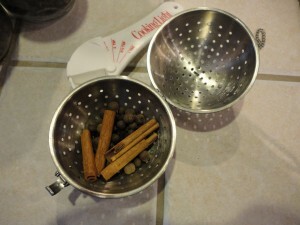 Break the cinnamon sticks into pieces. 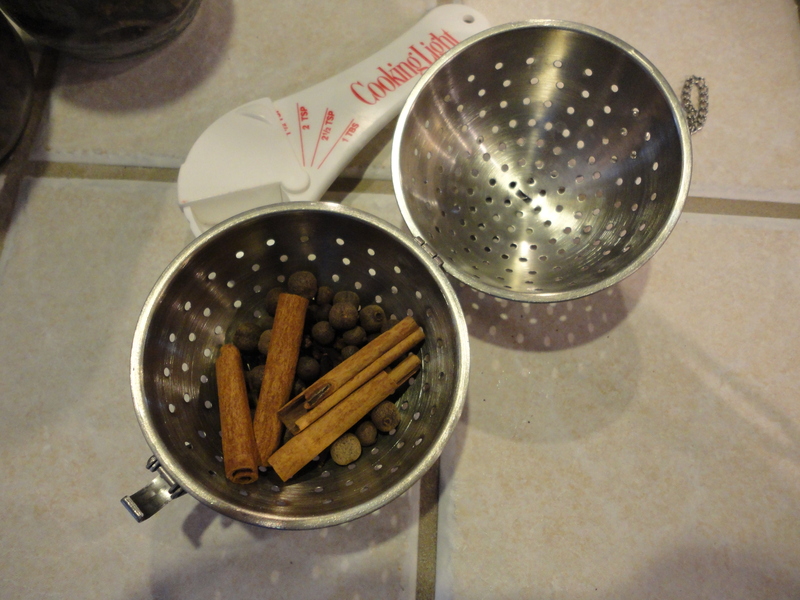 Put all the spices in a large spice or tea ball. If you don't have a spice ball, tie everything up in cheesecloth. Put the vinegar and sugar into a large saucepan. Stir over low heat, until the sugar has completely dissolved. Add the spice ball. Bring to a boil, lower heat, and simmer for 5 minutes. Add the blackberries and and bring back to a simmer. This will start to smell fabulous! Simmer for 10 minutes longer. Remove from heat and leave the blackberry mixture to cool completely. Discard the spice ball. Pour mixture through a chinoise. Pour into a sterilized jar to store. The vinegar is now ready to use. Store in refrigerator. Makes about 1 quart. I can’t wait to make a salad. After dealing with more blackberries, trying to tidy up the flower beds, and attempting to clean house, there was only one more thing to do to utilize the surplus of blackberries…make a cocktail. 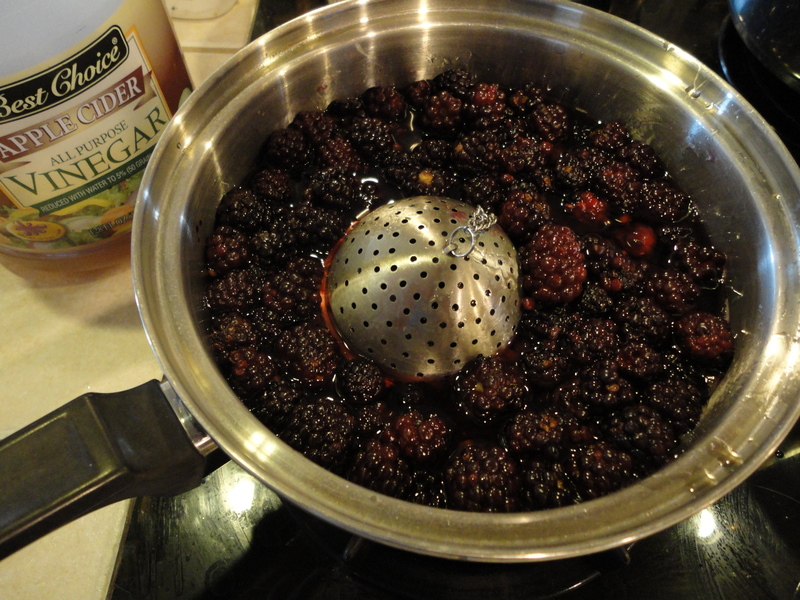 In a small mixing bowl, add blackberries and sugar. Mash with a potato masher to combine. Let set for five minutes. After five minutes, strain through a sieve into a large pitcher. Add frozen lemonade to blackberry mixture. Use the empty lemonade can to measure tequila. Pour tequila into pitcher. Stir will. Add club soda and crushed ice if you like. Fill margarita glasses with crushed ice and pour margaritas. Garnish with berries and mint. I still have two quarts left. I will use a few berries to garnish pancakes when we use the Blackberry Syrup. 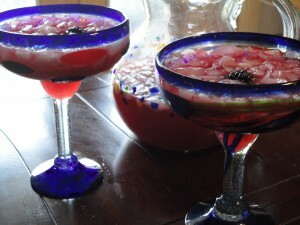 I will use a few more when I make more ‘Ritas for the Fourth. And I saw a wonderful looking lemon pound cake at From Cupcakes to Caviar that I am dying to try. Won’t that be great with fresh blackberries? By that time, I bet I have used up all twelve quarts! I declare Operation Blackberry over with until next summer. Whew! I feel victorious!